← The Five Best Windsurfing Spots in the World! Why wait by the water’s edge when you can get down in the deep amongst all the real action? 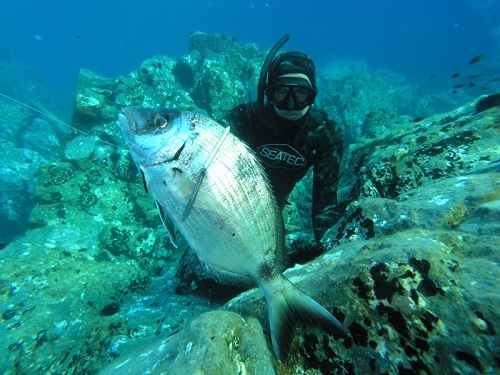 Spearfishing is a chance to get right up close with your prey and dangerously on the edge of your limits. You’ll need to hold your breath, take the dive, be quiet and quick. Unlike fly fishing, there’s no sitting down, having a sandwich or sunbathing involved. When you go spearfishing, you’re going hunting. It’s only you down there in the dark depths – you, your speargun and your resolve. Although spearfishing is all about relying on the strength of your mind and body, you’ll still need to kit yourself out with some basic underwater gear. Get hold of a wetsuit, fins, goggles and a weight belt from an established water sports brand. Also ensure that your equipment is well-fitting and comfortable – after all, you could be in the water for hours before you make the catch. Yet, your most important piece of equipment is your spear gun. These guns work in two ways: with rubber slings or compressed air. They are also available in various different sizes and ranges, to suit different types of spearfishing and levels of expertise. For big fish in open, deep waters, powerful and long-range guns work best. For hunting reef fish in the shallows, smaller range guns are fine. Beginners should choose a long-ranged spear gun (between 1.1 and 1.2 meters) to get started. You’ll also want to make sure you have equipment for storing any fish that you keep. An ice box is an essential, and if you are planning on camping, you may want to invest in a climbing treestand. Pop over here to find out more. 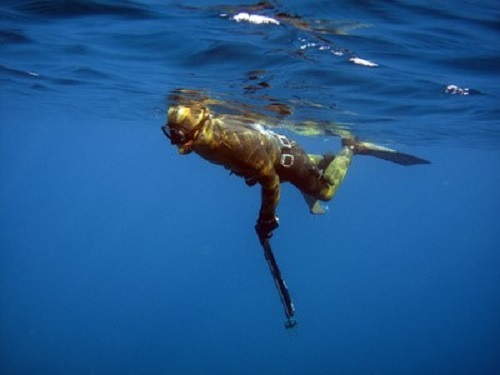 Spearfishing is a sport that demands strength, fitness and determination. In tricky underwater spots, you could spend hours in the water subjected to rough currents and harsh temperatures. You’ll need to practice in this type of environment, master your breathing techniques and get fighting fit. Spearfishing also takes a lot of patience and skill. Fish are easily scared by noise or movement so when you take that dive or make that move towards your catch, it will always need to be quiet and controlled. This is also something you can learn with experience. You certainly won’t become a pro in the sport overnight so you might want to join a club or get some tips from a spearfishing professional to help you progress. First of all, you’ll need to find a fish to catch and this is not as easy as it sounds. There might be hundreds of fish swimming around beneath you but is there one apart from the group that looks weak and less aware? This should be your target. To find a meandering fish, you could swim across the surface of the water and look down. Or, you could take the dive and wait to discover a catch from the fish around you. However you decide to search, just remember to control your movements in a calm, slow and quiet manner. More often than not, the largest volumes of fish can be found amongst foliage, wrecks or reefs. When you’ve decided on your target, you’ll need to get your spear gun at the ready and get as close to the fish as you possibly can. Look across the line of the barrel to aim to hit the fish on its flank for the best chance of a holding shot. 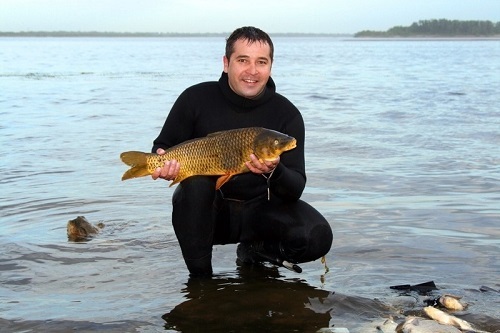 If you successfully spear a fish, it is important to keep hold of it. Move it safely out of the way of any foliage or rocks by towing it gently to the surface using the line attached to the spear. Then, if the fish isn’t already dead, make sure you kill the fish as humanely as possible using a spearfishing knife. Spearfishing takes time, effort and a sheer strength of mind to master. But is there anything quite like getting wet, holding your breath, hunting your prey and bringing your catch home to dinner? Mark grew up in Scotland amongst an array of open lakes and wildlife. Here, he developed a passion for spearfishing and freediving from a young age before he trained up to become a full-time spearfishing instructor. He now takes his work overseas to exotic locations such as Costa Rica and Panama. He recommends the purchase of spearguns and other spearfishing equipment at www.apnea.co.uk. This entry was posted in Scuba Diving, Water Sports and tagged Scuba Diving, Snorkelling, Spearfishing. Bookmark the permalink.